1 day: Arrival in Buenos Aires. Accomodation in a hotel 3 or 4 stars. Free time. 2 day: Flight to Ushuaya. Accomodation in hotel 3 stars. 3 day: Free morning. Boarding on cruise ship. Channel Beagle. 4-5 day: Drake passage. South-Shetland islands. Observing fauna of the islands. Non-government expeditions (primarily tourist ships) also visit the Antarctic. While commercial Antarctic tourism dates back to the late 1960s, there has been rapid growth since the late 1980s. This has led to a wide range of tourist and adventure activities. The debate over the merits of Antarctic tourism echoes debates over other wilderness regions. 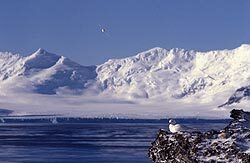 Tourism has allowed many people who might not otherwise have the opportunity, to experience the wonders, and understand the importance, of Antarctica. Their experiences have led to a greater recognition in the wider community of the region's importance to the world. On the other hand, as more and more people visit the southern regions, the risks of environmental damage increase: wildlife disturbance, vegetation trampling, diseases and pollution are among the concerns. 13 day: Ushuaya. Flight to Buenos Aires. 14 day: Buenos Aires. Tour of the city. Free afternoon. Evening devoted to tango. 15 day: Flight back from Buenos Aires.